Mrs Chris McIlroy has been honoured for her commitment to Teynham by being made an Honorary Freeman of the Parish. She served as a hard-working and dedicated Clerk to Teynham Parish Council for nearly 40 years before retiring in 2015. She is the second person to be honoured with such an award, following the presentation to long-serving Parish Councillor Walter Lewis a year ago. 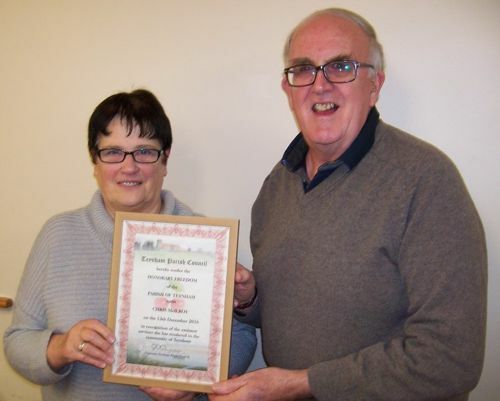 Mrs McIlroy was presented with a certificate to mark the honour in front of Teynham Parish Councillors and guests by Parish Council chairman Brian Sharman. A surprise presentation marked Mrs Chris McIlroy’s final day as Clerk of Teynham Parish Council – after more than 38 years in the job! 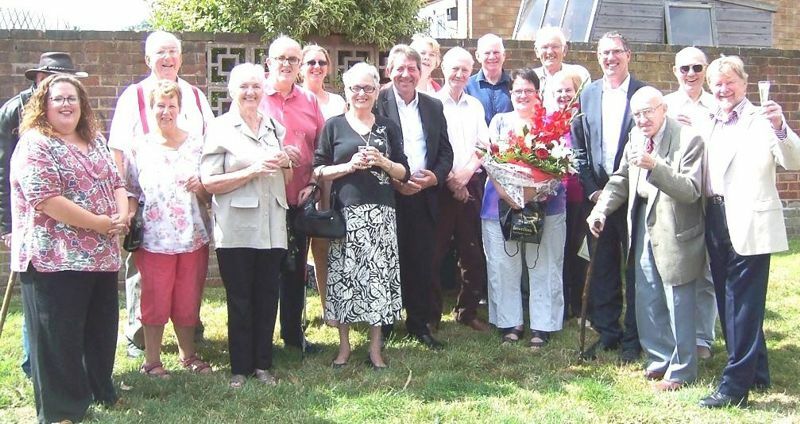 MP Gordon Henderson, borough councillors and parish councillors were joined by friends outside her house in Teynham to present her with a huge bouquet of flowers and a citation from the House of Commons. Chairman of the Parish Council, Brian Sharman, thanked Mrs McIlroy for her service, commitment and loyalty. Mrs McIlroy, who is being replaced as Clerk by Mrs Hayley Steel, (left in the photograph) said she was looking forward to retirement but will miss a job which she has thoroughly enjoyed doing. A week after Mrs Chris McIlroy retired as Teynham Parish Clerk, having served 38 years in the job, she went back to work. It was only for one night but such is her loyalty and dedication she readily stood in as Clerk at a Parish Council meeting because her replacement was on a pre-arranged holiday. None of the Parish Councillors have ever known what it’s like to attend a meeting without Mrs McIlroy, shorthand pencil at the ready along with an encyclopaedic knowledge of everything that goes on in Teynham, including Conyer. The day in the 1970s that Chris, along with then new husband Jack, moved to Teynham was a lucky one for the community she went on to serve with such distinction and for such a long time. The couple lived and worked in London but couldn’t afford the sort of house they wanted there. They’d read about a new estate in Teynham, but on their first visit by car had to stop in Sittingbourne and ask a policeman how to get here. “Tainham” she called it but the policeman corrected her pronunciation and directed her to Honeyball Walk. And that’s where the McIlroys have lived ever since. For a while she commuted back to London, leaving at 6.30am and arriving home after 7.00pm. She found a job nearer home as a secretary at Marley Floors, and then took on her first community role when she was invited to be the secretary of Teynham and Lynsted Playing Fields Management Committee. She did so well at that an offer to become Clerk to Teynham Parish Council soon followed, though the job back in 1977 was nothing like as hectic as it’s become today. The role of Parish Clerk gradually expanded, with responsibility for The Meadow and a Teynham newsletter added to the allotments, playing field and streetlights. Then came concessionary bus passes to organise as Teynham became the first parish to introduce them before Swale Council eventually took over the administration. The Frognal Gardens car park became another Teynham responsibility and the Community Hall another, when it was purchased in 2007. At a surprise presentation on her final day in the job, Mrs McIlroy was presented with a huge bouquet of flowers by the Chairman of Teynham Parish Council, Brian Sharman, who publicly thanked her for her long service, commitment and loyalty. A certificate of appreciation from the House of Commons, was presented by Gordon Henderson MP. Chris, who has a daughter and two grandchildren, has been replaced as Parish Clerk and Responsible Financial Officer by Mrs Hayley Steel.